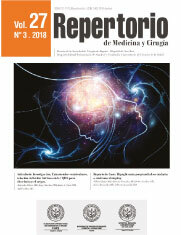 Objetivo: revisión ampliada de la literatura sobre la falla de la reconstrucción del ligamento cruzado anterior (LCA). Materiales y métodos: se realizó la búsqueda de la literatura utilizando los términos de falla y reconstrucción del LCA. Se incluyeron estudios publicados posteriores a 1980 de cualquier diseño metodológico. Resultados: se analizaron 25 estudios que muestran diferentes características de la reconstrucción del LCA y su relación con la falla. Los resultados se presentan de manera narrativa. Conclusión: es importante conocer la etiología de la falla, dado que con el incremento de las reconstrucciones primarias cada día es más frecuente realizar este tipo de procedimientos. El adecuado entendimiento de la causa de la falla conduce a mejores resultados en la revisión de la reconstrucción de LCA. 1. Griffin LY, Albohm MJ, Arendt EA, Bahr R, Beynnon BD, Demaio M, et al. Understanding and preventing noncontact anterior cruciate ligament injuries: a review of the Hunt Valley II meeting, January 2005. The American journal of sports medicine. 2006;34(9):1512-32. Epub 2006/08/15. 2. Johnson DL, Fu FH. Anterior cruciate ligament reconstruction: why do failures occur? Instructional course lectures. 1995;44:391-406. Epub 1995/01/01. 3. Kamath GV, Redfern JC, Greis PE, Burks RT. Revision anterior cruciate ligament reconstruction. The American journal of sports medicine. 2011;39(1):199-217. Epub 2010/08/17. 4. Noyes FR, Barber-Westin SD. Revision anterior cruciate surgery with use of bone-patellar tendon-bone autogenous grafts. The Journal of bone and joint surgery American volume. 2001;83-A(8):1131-43. Epub 2001/08/17. 5. Alford JW, Bach BR, Jr. Arthrometric Aspects of Anterior Cruciate Ligament Surgery Before and After Reconstruction With Patellar Tendon Grafts. Tech Orthop. 2005;20(4). 6. Jr. BB. Revision ACL reconstruction: indications and technique. In: Miller MD, Cole BJ (eds). Philadelphia: Elsevier; 2004. 7. George MS, Dunn WR, Spindler KP. Current concepts review: revision anterior cruciate ligament reconstruction. The American journal of sports medicine. 2006;34(12):2026-37. Epub 2006/11/10. 8. Wright RW, Huston LJ, Spindler KP, Dunn WR, Haas AK, Allen CR, et al. Descriptive epidemiology of the Multicenter ACL Revision Study (MARS) cohort. The American journal of sports medicine. 2010;38(10):1979-86. Epub 2010/10/05. 9. Harner CD, Giffin JR, Dunteman RC, Annunziata CC, Friedman MJ. Evaluation and treatment of recurrent instability after anterior cruciate ligament reconstruction. Instructional course lectures. 2001;50:463-74. Epub 2001/05/25. 10. Johnson DL HC, Maday MG, Fu FH. . Revision anterior cruciate ligament surgery. In: Fu FH, Harner CD, Vince KG (eds). Baltimore: Williams & Wilkins; 1994. 11. Clancy WG, Jr., Narechania RG, Rosenberg TD, Gmeiner JG, Wisnefske DD, Lange TA. Anterior and posterior cruciate ligament reconstruction in rhesus monkeys. The Journal of bone and joint surgery American volume. 1981;63(8):1270-84. Epub 1981/10/01. 12. Wetzler MJ BA, Gillespie MJ, Rubenstein DL, Ciccotti MG, Miller LS Revision anterior cruciate ligament reconstruction. Oper Tech Orthop. 1996;6(3):181-9. 13. Trojani C, Sbihi A, Djian P, Potel JF, Hulet C, Jouve F, et al. Causes for failure of ACL reconstruction and influence of meniscectomies after revision. Knee surgery, sports traumatology, arthroscopy : official journal of the ESSKA. 2011;19(2):196-201. Epub 2010/07/21. 14. Howell SM, Barad SJ. Knee extension and its relationship to the slope of the intercondylar roof. Implications for positioning the tibial tunnel in anterior cruciate ligament reconstructions. The American journal of sports medicine. 1995;23(3):288-94. Epub 1995/05/01. 15. Ristanis S, Giakas G, Papageorgiou CD, Moraiti T, Stergiou N, Georgoulis AD. The effects of anterior cruciate ligament reconstruction on tibial rotation during pivoting after descending stairs. Knee surgery, sports traumatology, arthroscopy : official journal of the ESSKA. 2003;11(6):360-5. Epub 2003/10/08. 16. Gersoff WK, Clancy WG, Jr. Diagnosis of acute and chronic anterior cruciate ligament tears. Clinics in sports medicine. 1988;7(4):727-38. Epub 1988/10/01. 17. Noyes FR, Barber SD, Simon R. High tibial osteotomy and ligament reconstruction in varus angulated, anterior cruciate ligament-deficient knees: a two-to seven-year follow-up study. The American journal of sports medicine. 1993;21(1):2-12. 18. Kurosaka M, Yoshiya S, Andrish JT. A biomechanical comparison of different surgical techniques of graft fixation in anterior cruciate ligament reconstruction. The American journal of sports medicine. 1987;15(3):225-9. Epub 1987/05/01. 19. Gertel TH, Lew WD, Lewis JL, Stewart NJ, Hunter RE. Effect of anterior cruciate ligament graft tensioning direction, magnitude, and flexion angle on knee biomechanics. The American journal of sports medicine. 1993;21(4):572-81. Epub 1993/07/01. 20. Arneja S, McConkey MO, Mulpuri K, Chin P, Gilbart MK, Regan WD, et al. Graft tensioning in anterior cruciate ligament reconstruction: a systematic review of randomized controlled trials. Arthroscopy : the journal of arthroscopic & related surgery : official publication of the Arthroscopy Association of North America and the International Arthroscopy Association. 2009;25(2):200-7. Epub 2009/01/28. 21. Jaureguito JW, Paulos LE. Why grafts fail. Clinical orthopaedics and related research. 1996(325):25-41. Epub 1996/04/01. 22. Poolman RW, Abouali JA, Conter HJ, Bhandari M. Overlapping systematic reviews of anterior cruciate ligament reconstruction comparing hamstring autograft with bone-patellar tendon-bone autograft: why are they different? The Journal of bone and joint surgery American volume. 2007;89(7):1542-52. Epub 2007/07/04. 23. Harner CD, Irrgang JJ, Paul J, Dearwater S, Fu FH. Loss of motion after anterior cruciate ligament reconstruction. The American journal of sports medicine. 1992;20(5):499-506. Epub 1992/09/01. 24. Brown CH, Jr., Carson EW. Revision anterior cruciate ligament surgery. Clinics in sports medicine. 1999;18(1):109-71. Epub 1999/02/24. 25. Keene GC, Bickerstaff D, Rae PJ, Paterson RS. The natural history of meniscal tears in anterior cruciate ligament insufficiency. The American journal of sports medicine. 1993;21(5):672-9. Epub 1993/09/01.